HUAMA, Cuzco, Peru, May 9 2008 (IPS) - A plate of parboiled potatoes of various sizes, shapes and colours welcomes the visitor to Huama, a town in the southern Peruvian Andes, at an altitude of 4,500 metres. "Help yourself, miss. Eat what we reap," offers Rafael Pilco, president of the conservationists in this impoverished community in the Cuzco region, where 200 native varieties of potatoes are grown and protected from pests and climate extremes. Wearing colourful ponchos, the leaders of the group and their spouses take us to the "chacras", or fields, in the highlands where they are conserving this international nutritional treasure. More than 8,000 years ago, the potato (Solanum tuberosum) was domesticated in this region. U.S. taxonomist David Spooner of the University of Wisconsin determined that the potato’s place of origin lay between Cuzco and the Altiplano, or high plains region, shared with Bolivia. Of the 120 families in Huama, 40 are dedicated to preserving this food based on their ancestral knowledge and beliefs. The rest raise livestock and grow crops including the potato, maize, "olluco" – another root vegetable – and other produce. "We plant when the moon is full, because if we do so without the moon, the diseases come and production isn&#39t good," Pilco explains in the Quechua language, as his fellow farmers nod in agreement. For the past three years, the 40 families have supplied two of the best hotels in Cuzco with the culinary benefits of the native varieties of potato under an agreement that has allowed them to sell 20,000 kg so far. The potatoes sell for around 50 cents of a dollar per kilo, of which just 10 percent is profit, say the farmers. But in the end, their share is actually lower, since that calculation doesn&#39t factor in transportation costs. The women are in charge of sales because – as the men themselves insist – they are better at business. Agronomist Miguel Angel Pacheco, of the governmental National Institute of Agrarian Innovation (INIA), helps with translation from Quechua to Spanish. He says is amazed at how well organised the community is. "The potato is the symbol of Peru as a crop that has allowed development in the Andes, as a staple food, economic activity and even as a ritual. 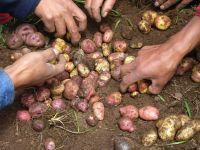 The potato signifies ‘pachamama’ (Mother Earth), that which is born from the earth, and has great potential to contribute to our economy," Mario Tapia, an expert with the United Nations Food and Agriculture Organisation (FAO), told Tierramérica. The conservation of native potatoes, a task the Incas began to carry out, continued for centuries. But the effort was nearly lost with the expansion of pests and diseases and the devaluation of these varieties in the larger markets, where they were replaced by new, hybrid varieties obtained through modern techniques, selected for high yields. In Huama, just four families kept up the tradition, which began to gather new momentum 10 years ago. What brought about the change? The farmers said community organisation improved when they decided to fight alcoholism, a widespread problem in Peru’s highlands region. "Alcohol led to childhood malnutrition because parents left their children without food, and it also led to domestic violence," explains local leader Gregorio Barrientos. Anyone who touches alcohol now, "even just a little drink," has to pay a fine of 54 dollars, he says. Camilo Huaraca, 48, is the head of one of those original four families, and today has more than 150 varieties of potato growing on his farm. "I am a conservationist through the legacy of my grandparents. Before, I had just 60 varieties, and later I expanded my collection at the fairs, where I exchanged seeds with other farmers," he tells Tierramérica. At the fairs, promoted by non-governmental organisations like Arariwa, small farmers from around the country compete in exhibiting their varieties, and the winners are awarded natural fertiliser like guano (manure) or farming tools. In June, the Ministry of Agriculture, with support from FAO, will hand out awards to 35 families working in potato conservation. The process includes workshops in which the finalists are selected and requests for assistance made, under the direction of FAO expert Tapia. This year, declared International Year of the Potato by the United Nations, has seen major problems caused by high prices and shortages of many basic foods around the globe. Peru has the world&#39s largest potato germplasm bank, containing seeds, tissue cultures and plants representing 5,000 varieties from across the Andean region, of which more than half originated in this country. Management and research are in the hands of the non-governmental International Potato Centre. In Huama, FAO has developed a programme to improve seeds, and the INIA headquarters in Cuzco is committed to providing assistance to boost production and to link the farmers to attractive markets. It also means offering processed foods: dried potatoes, the main ingredient of dishes like "carapulcra", whose recipe also calls for red chilli, peanuts, onions, garlic and different kinds of meat. "We want to trade knowledge with these communities so that they have better tools for cultivation and for entry into the market," INIA agronomist Ladislao Palomino told Tierramérica. The Institute also studies the culinary and nutritional benefits of the potato in order to make the information available to small farmers and entrepreneurs who want to invest in products made from the native potato varieties. "The &#39puca sonjo&#39 potato has high content of anthocyanin and betacarotene, which contribute to preventing cancer. This gives high added value to the consumption of this food," says Palomino. INIA president Walter Delgado travelled with Tierramérica to Huama, where he noted the drop in production this year, after three frosts and scant rainfall. The farmers say the livelihood of their families is in danger – as is the sale of 5,000 kg of native potatoes to the Cuzco hotels. To deal with these setbacks, the farmers have developed a technique of mixed cultivation: they plant different crops on the same plot of land to improve the chances for a healthy harvest, because some plants are hardier than others. The INIA experts hope to confront these challenges with the project "Andenes", in which they study the agronomic traits of the potato, including its adaptation to high temperatures and the discoveries of new viruses. Meanwhile, the farmers are not giving up their ancestral practices to guarantee a good harvest. They "pay back" the earth with offerings, in the presence of the "arariwa", guardian of the crops. "He is chosen by all of us. He is a respected person and is treated like the first man," Huaraca explained.